Confederate soldier Autograph Letter Signed by Willam S. Elliot, Captain 17th South Carolina Vols, 1pp. 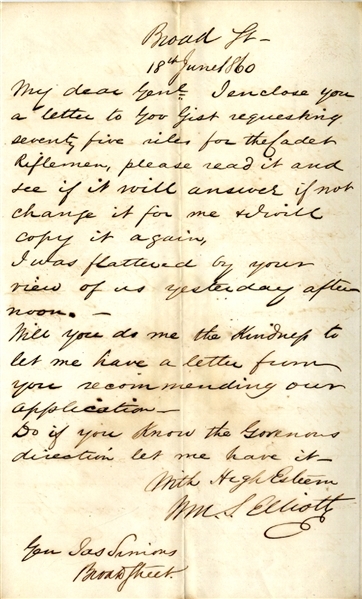 octavo, June 18, 1860, addressed to General Simons, and reads “ I enclose you a letter to Gov. Gist requesting seventy-five rifles for the Cadet Rifleman....Do if you know the Governors directions, let me have it...” Fine condition.